Michael Leung*5from Hong Kong, wrote a story on Kyoto University Yoshida Dormitory*6 and the controversy regarding the Tatekan*7, free public speech on wooden boards. Michael is back home working with alternative usages of streets. I met Michael in Osaka at an embroidery workshop offered by him*8. In Hong Kong, Michael is engaged in the protection movement of the Pang Jai*9, the cloth market, which is facing the danger from the redevelopment of the city. This workshop was about making embroidery on Pang Jai handkerchiefs. 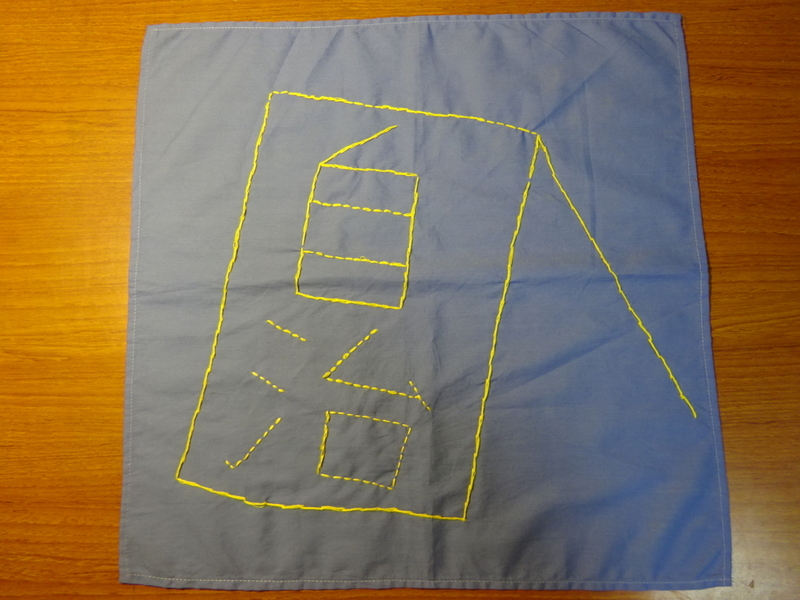 I tried to draw on the handkerchief a Tatekan with the word Jichi, which stands for self-governance, because as a graduate of Kyoto University I was furious about the oppression from the University on the Takekan culture and Yoshida Dormitory. Some days later Michael sent to me a fiction written in English about Tatekan and Yoshida. With his permission, I translated it into Japanese with the help of my Japanese friends. Here I put the translation and the original. It began on Sunday 13th May 2018 when without warning Kyoto University removed students’ signs around the campus. Apparently the signs, flat against the wall, breached a city ordinance. The signs are our collective voice: to other students; the public; and those we have yet to meet. We support free speech and installed a few new signs, now visible on the busy intersection of Higashioji-dori and Imadegawa-dori. A couple of weeks later, we were told by obaasan Haruka, an insomniac grandma who walks her red Shiba Inu (dog) at night, that the university's security guards brought torches and wire cutters to quietly dispose of the few remaining signs on the intersection. The following morning over 5,000 students occupied the intersection, bringing traffic to a complete standstill. We only let the emergency services past – ambulances and fire engines only. No police. After exactly 24 hours, we amplified our demands using a human microphone from the centre of the intersection and then dispersed, with the potential to reassemble, if necessary. The university retracted their signage policy and even wrote a formal apology on their website homepage (Japanese only), which they only displayed for one day*16. Further down the road, the university is now putting pressure on the Yoshida dormitory students to stop accepting future residing students. The 105-year-old wooden building is the last bastion of student rights and full autonomy in the neoliberal university, a collapsing education system. All this campaigning and studying (I'm in my final year of my Food and Environmental Economics course) has left me exhausted, but I know that I have to keep going. My friend Atsuko once told me that the future belongs to the determined. She's completely right. My long bus journeys between Omiyakusayama and the university have further drained me. When I heard that there was a sharing from Hong Kong activists at Yoshida dormitory, I visited and stayed at the end for the give-what-you-think dinner that was cooked by a vegetarian cooperative*17. I drank too much of the Wang Chau jackfruit mead and fell asleep in a room that was filled with manga novels and zines from all over the world. When I woke up, a ZAD*18poster*19 eclipsed the sunlight coming in through the open window. I saw two students in the room with me, whispering and editing the Japanese and English versions of the dormitory's manifesto. It was Akiko and Shintaro (a friend that I met during orientation camp). Akiko recognised me first from the intersection and gave me some words of encouragement. I didn't know how to respond, and instead one of the chickens outside timely clucked and answered for me. We all laughed together. After a pot of black coffee, Shintaro told me that he has finally tidied up his room and that if I wanted to, I could share the room with him for free. He remembered that I lived far away with my parents and could see the bags forming under my eyes, and my scruffy hair. The latter is a personal choice! I took him up on his offer and moved in the following day. Shintaro's room, now our room, was on the second floor. I was amazed by how spacious, clean and well-curated the objects in the room were. The atmosphere reminded me of Trần Anh Hùng's Norwegian Wood. After a week, I was invited by the vegetarian cooperative to farm on the unused green space next to the ducks and chickens. Akiko must have told them that I was studying agriculture and was a FarmerX*20. At the next weekly dormitory meeting, in the secret room of the building, we decided to call the farming area 'Little Yoshida Garden' in reference to friends who are growing food outside Miyashita Park*21 in Shibuya, Tokyo. When we are organised and unite in solidarity, I know for certain that the future belongs to us – a shared destiny*22. Gambate! I made this translation because I wanted to show that even far away in Hong Kong there are people who are supporting us. As is shown in his story, in many parts of the world people are being oppressed by authorities. I hope that we can all unite and fight together, beyond boundaries and language barriers.